Welcome to an exciting and fun new series entitled Side Hustle True Story. 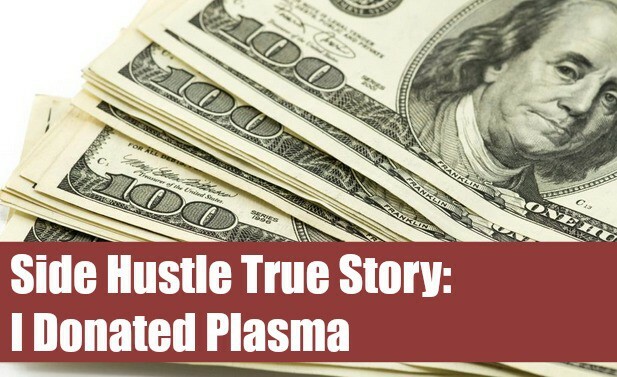 In this series, I am going to go into detail about some of the more interesting side hustle jobs I have done in the past. Some of these jobs were well worth it and a lot of fun. Other side hustle jobs were a total failure! This week's post is no different. I used to donate plasma to earn extra money. This is a pretty extreme side hustle as it involves using your body to (legally) make money. This is a useful article if you are considering donating plasma or wondering how the process really works. Plasma is the liquid portion of blood and is made up of proteins. These proteins help fight off infections! Plasma also regenerates quickly, which is why people can donate often. If you are unsure if there is a plasma center near you, do a quick google search or check out CSL Plasma. Call and make an appointment over the phone. Most plasma centers are open 6 days a week. My center was open from 6am to 8pm during the work week and half a day on Saturdays. Your first appointment will seriously take 2-3 hours. You have to get a physical and do a ton of paperwork. Once this is done, you can finally donate plasma. It's extremely tedious and really weeds out the people who are serious about donating. Once you have completed your 1st donation, you are now able to schedule all your future appointments! This means you can donate two times a week with a 48 hour resting period between appointments. This resting period is important because you're body needs time to recover! Most centers book appointments via telephone or online. I found it easier to book online. I was able to log on and view the calendar, which listed all the available appointments. I could even book my appointments up to one month in advance. Most appointments took me 45 minutes to 1 hour. I liked to book mine first thing in the morning or at the end of day, as these were the slower times. Before donating, a nurse will check your blood pressure, your temperature and prick your finger to make sure everything looks normal. Once everything is clear, the nurse will start the process. The actual donation time depended on how fast your body produced the plasma. If you drink a ton of water, you were much more likely to finish faster than someone who came in hungover and dehydrated. After you finish donating, it's recommended to rest for 5 to 10 minutes. The nurses also advised against lifting anything heavy for the remainder of the day. Your sugar level might be low as well, so many facilities will provide juice and cookies to get your levels back to normal. What kind of people donate plasma? All kinds of people! The plasma center I went to was in a really nice area . There was a mix of professionals, students, retirees and just regular people. I will say that there was another plasma center I look into and it attracted a really rough crowd. I felt extremely out of place and very uncomfortable. I also didn't like the facility itself. Make sure you do your homework first and are comfortable with your environment. How much money can I make donating plasma? Most centers advertise a person can earn $200 or more a month. This was correct! My pay schedule rotated, with one visit earning $35 and the next visit earning $20. This is a side hustle! How do I get paid? Different plasma centers pay differently. Some facilities pay in cash. The facility I went to gave each person a prepaid Visa card on the 1st visit. After each donation, a technician loaded payment onto the card, with the funds available immediately. Why did I stop donating plasma? This was a tough side hustle for me! I donated plasma off and on for a couple months. I was never able to go twice a week, because my body had a hard time recovering afterwards and I was tired for most of the day. The main reason I stopped donating plasma was because I fainted on 2 separate occasions. This was just too extreme for me and not worth the money! I tried donating plasma once despite my fear of needles (I thought maybe this would finally desensitize me). I spent about an hour there before a technician came out and said that my veins were too small. Oh well. What really got me was that EVERYONE there was wearing face shields. I asked why, and they were like, “Oh, sometimes we have squirters.” I was floored! Oh hahahaha, face shields?! Girl, I am with you on this. It is a GREAT way to make money and I have always seen more men at these centers than women. This is definitely where I had to draw the line!